A warning sign on one of the city's utility boxes on E. Broadway Avenue. A power outage affected local residents in the early morning hours Sunday, the third such outage in December for Unalaska Island. Electrical service to homes in the valley shut down around 4:10 a.m., and the initial outage lasted until roughly 6:45 a.m. Power was restarted for a quarter hour before shutting off once again just before 7 a.m. for an additional 15 minutes. As of 7:12 a.m. Sunday, the power was back on. For many, no electricity meant no heat as Toyostoves and other home heating systems shut down and indoor temperatures plunged. Overnight outside temperatures dipped to the high '30s and low '40s. Lengthy power outages also hit Unalaska Island on Dec. 15 and Dec. 18. 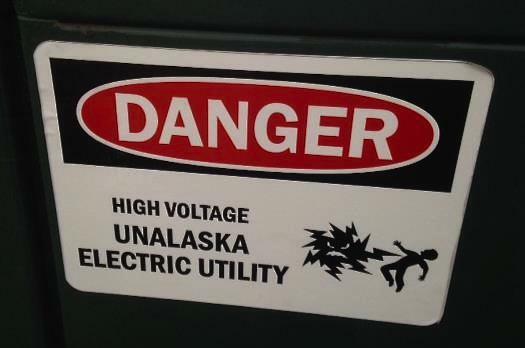 Dan Winters, Director of Public Utilities for the City of Unalaska, attributed those outages to a newly-installed and problematic transformer at the Alyeska seafood processing plant. 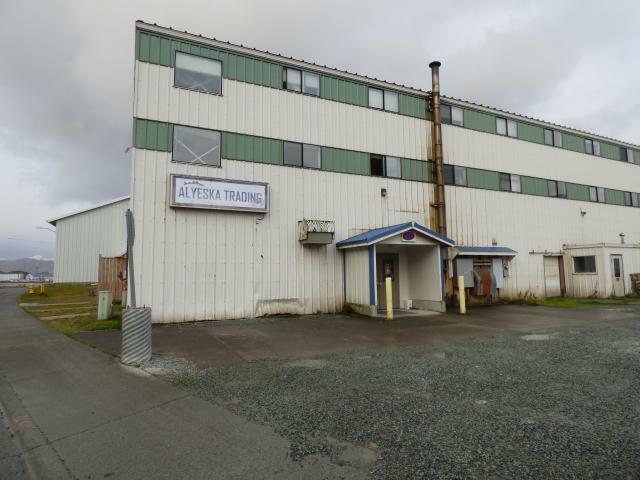 On Monday, Alyeska plant manager Don Goodfellow said the last two outages have not stemmed from the seafood processing plant. He said the plant has been generating its own power since the initial outage on Dec. 15. "We are not on city power at all now, and have not been since the first outage," Goodfellow said. He said the transformer blamed for the repeated December outages is city-owned and operated, and that the Alyeska plant is not currently using the equipment. City manager David Martinson elaborated on the outage in an email Monday afternoon. "This outage was caused by a failure of a transformer in a switch at the plant. We believe this was caused from stresses to the system from the two previous power outages.The outage took a while to repair because there were no stand offs in the switch cabinet. Without the stand offs we needed to isolate the transformer and switch from the rest of the system. The only way to isolate the transformers or switches was to take the whole grid down. We do not anticipate any other problems at this time," Martinson said. Recently-installed electrical equipment at the Alyeska seafood processing plant triggered a power outage Friday. KUCB reached Dan Winters, director of public utilities, by email Monday morning to ask about the suspected cause of Friday's outage. Winters said there was an unscheduled partial power outage at 3:45 p.m. It affected power customers on Unalaska Island and Captains Bay. All circuits were closed and full power back on by 4:10 p.m.